Hi, I love the planter box,where can I buy this kind planter? - Can you give me size of planter? and How much this one? Where can I find planter boxes like that? Hi, we supply these planters directly to our clients. They are light weight fiberglass with a metalic coating. Very durable and are available in a multitude of finishes and sizes. Please contact us at info@thegardenroutecompany.com for more details. 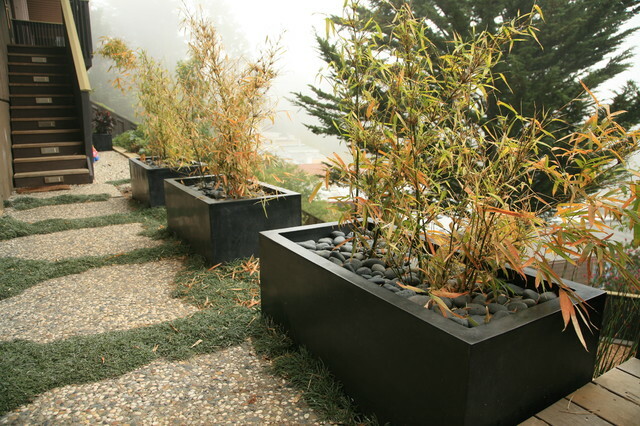 Here the fog obscures the view down the steep hillside that lies beyond these foreground planters. The bamboo really stands out against the fog. The Garden Route Company: Located In S.F.